Ham hocks can add a lot of flavor to bean soups, split pea soups and stews. Once it has done its job in the soup, you can remove the meat from the hock and add it to the pot or set it aside for another dish. Thaw the ham hock if it is frozen by placing it in the refrigerator for several hours. Place the ham hock in the pot with the stew or soup to which you'd like to add flavor and bring the pot to a boil. If you are not cooking a soup, just place the ham hock in a few inches of water in a large pot. Cover the pot. Simmer the ham hock until the meat becomes very tender (about three hours). Remove the ham hock from the water and allow it to cool. 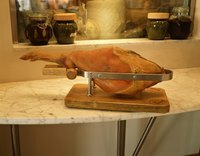 Once it is cool enough to touch, pull the meat, which looks just like ham, off of the ham hock. Shred the meat by pulling into smaller pieces, and put it back in the soup pot or store it for another dish. Discard the pork skin, bones and fat unless you'd like to leave the fat in the soup for extra flavor. How Do I Cook a Black Forest Ham in a Crock Pot?